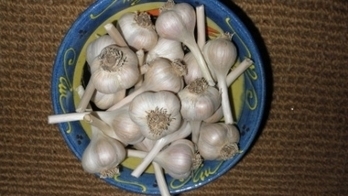 Garlic : ten organic varieties in bulk or braids. Early Red Italian, Polish White, Lorz, German Red, German Stiffneck, Purple Glazer, Chesnook Red, Spanish Roja, Kilarney Red, and Romanian Red. Try our signature farm made garlic cooking wine. Artisan Fruit Wines handcrafted from fruits and berries grown on the farm. Currently available: Hard Cider, Red Currant, Apple, Raspberry, Cranberry, Blackberry, Plum, and Garlic cooking wine. Pottery - Hand-thrown on the farm. A variety of pieces including garlic keepers and bakers. We have many unique baskets and fun gifts. We are on Thurston County Bountiful Byway. Just follow the signs going north from Hwy 12 in Rochester or south from Olympia along Blacklake Blvd. It's a scenic loop highlighting the hidden treasures of south Thurston County. www.thurstonbountifulbyway.com.